His goal at the World Cup of 1974 against Italy was legendary. Emmanuel Sanon, from the small island of Haiti, made Italian defenders look like fools. Sanon played soccer with his heart; he had no sense of strategy– “that’s playing soccer like a robot”. The Haitian Athlete of the Century always took much pleasure in the game, until his untimely death in 2008. 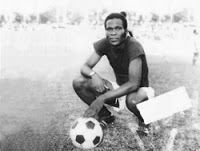 Emmanuel ‘Manno’ Sanon (born June 25, 1951 in Port au Prince) lost both his parents at a young age. Being a foster child he was brought up by the congregation Salesians of Don Bosco, dedicated to youth care. The Dutch pastor Sjaak Diebels had founded a soccer club for these children, named Don Bosco. Sanon joined this team, and it soon became clear he was the biggest talent of them all. His uncanny ability to score goals, made Don Bosco a serious contender for the national title of Haiti. In 1971 Don Bosco indeed did win the national league. At the time, Sanon was already playing for his country. 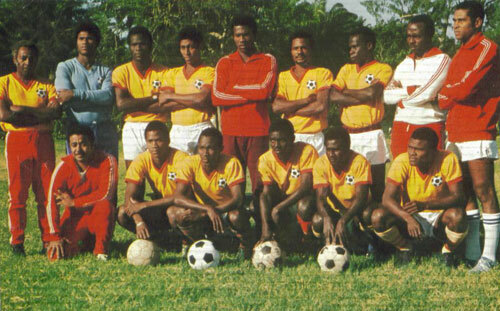 Haiti did come close to qualifying for the World Cup 1970 in Mexico, without Sanon. But enhanced with his Sanon’s scoring abilities, Haiti’s chances for the next World Cup in Germany in 1974 dramatically increased, only being rivaled by Mexico and Trinidad. First Haiti beat Puerto Rico 7-0 and 5-0, with Sanon scoring three times in both matches. After that, Haiti played in the final round against Mexico, Trinidad, Guatemala, Honduras and the Dutch Antilles. Dictator Baby Doc Duvalier paid a large sum of money to ensure home-advantage for the Haitian soccer team. They started well, winning 3-0 against the Dutch Antilles, with Sanon scoring twice. After that, Trinidad was beaten 2-1 (one goal by Sanon), just as Honduras (1-0). That gave them six points, two ahead of Mexico and four ahead of Trinidad. On December 13, 1973, Sanon scored both goals against Guatamala (2-1). One day later Trinidad defeated Mexico 4-0, which made Haiti out of reach for both Mexico and Trinidad. So the big adventure could begin for Sanon and his teammates. The Haitian soccer association decided to prepare for the World Cup in the Netherlands. In the last Month before the tournament Haiti first won against Dutch top level club Go Ahead Eagles 1-0 (the goal coming from Sanon, obviously), but the team lost against AZ’67 1-3 and against the Dutch National Military Team 1-4. Sanon made one goal against a regional selection which Haiti won 3-1, but the faith must have vanished completely after Haiti lost 4-0 against a selection of amateur players from the small Dutch town of Leiden. So now everyone was expecting Haiti to lose big time during this World Cup. Their first opponent was Italy, silver medalist of the previous tournament. Before the match on June 15 in Munich Italian goalkeeper Dino Zoff has set a new record, staying undefeated in more than twelve international matches in a row (1096 minutes). Haiti manages to finish the first half without any damage, 0-0. Then, in the first minute after the break, Sanon runs after a long ball, beats Fabio Capello on speed, gets past Zoff and puts the ball in the net. Zoffs record ends after 1142 minutes. Shortly after the goal Gianni Rivera puts Italy level, and eventually the big favorite wins 3-1. Four days later Poland gives Haiti no chance at all, winning 7-0. Now the team can’t reach the next round anymore, and only the match against Argentina remains ending 4-1 in favor of the South-Americans, but not before Sanon scores his second goal; a fierce shot from outside the box. So, Haiti didn’t perform as bad as everyone feared, and they gained a lot of sympathy. Of course, for most players the level was too high. Goalie Henri Francillon arrogantly considered himself the best of the tournament. He got signed by German second division club München 1860, but failed to perform to expectation, and quite disillusioned returned home one year later. Big star Sanon did much better. On June 25 (his 24th birthday) he was given a contract by Belgium club Beerschot. Henri Francillon (in the blue shirt). So now Sanon lived in Antwerp, in a small apartment close to the Olympic Stadium. He and his wife lived a rather boring life, feeling a bit lost in their new surroundings. On top of that, Sanons career at Beerschot failed to live up to his expectations. Belgium defenders were rough on him, and tactically he didn’t understand what the team needed from him. Besides, he thought most of the players in Belgium lacked the elegance and talent to be any good, with the exception of his teammate Juan Lozano, Beerschot’s playmaker. Fortunately, coach Rik Coppens, a big soccer star of his own time, considered Sanon very talented. So he tried getting him used to the roughness of the game in Europe. Coppens made Sanon into a defender, forcing him to make tackles himself and clash with forwards. It worked wonders. After that, Sanon returned to the upfront position and began to score and provide goals. Meanwhile, he also tried to get Haiti into the World Cup in Argentina, in 1978. In the second round Haiti defeated Cuba 1-1, 1-1 and finally 2-0, with Sanon scoring all of the goals. During the final round Haiti was no match for Mexico. Despite his troubled start, Sanon scored a total of 43 league goals and was instrumental in the Cup final of 1979. Against Club Brugge, Sanon rushed past all his opponents and gave teammate Johan Coninckx an opportunity he couldn’t miss. It was the only goal of the match, crowning Beerschot Belgian Cup winner. One year later his time in Belgium came to an end. Big club RSC Anderlecht was looking for someone to replace Rob Rensenbrink and had their eye on Sanon. Negotiations started, but along the way something went wrong. Sanon blamed Beerschot and decided to leave. The Haitian striker took the plane to Miami –close to Haiti - where he played in the second division with Miami Americans. Within a month Sanon changed clubs, and together with his coach Ron Newman tried his luck at San Diego Sockers. That worked well, Sanon scored 10 goals that season and the situation even improved, when San Diego contracted a young Mexican, Hugo Sanchez. Together they were lethal. After a satisfying second year Sanon got a serious knee injury and had to quit professional soccer at the age of 31. Emmanuel Sanon started a new life as coach, mainly involving himself with youth soccer. For a short period, 1999 until 2000, he was coach of the national team of Haiti, but failed to get to the World Cup in Japan and South Korea. Nonetheless, he did get awarded the title of “Haitian’s Athlete of the Century” in 1999. Working as a coach for the Ajax Orlando youth team in Florida, Sanon was diagnosed with pancreatic cancer. He died on February 21, 2008, at the age of 56. 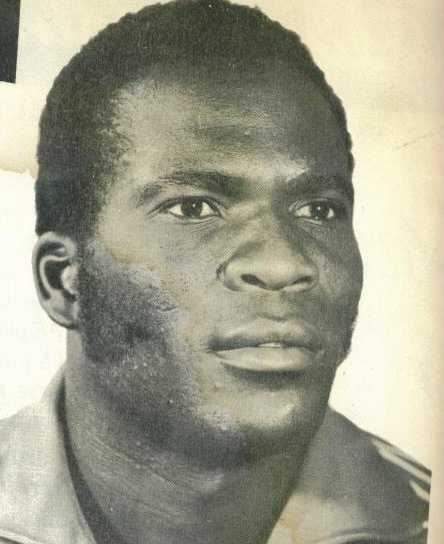 Back in Haiti the beloved Sanon was given a national burial ceremony at the Sylvio Cator Stadium, with his teammates from the 1974 Haitian national team, carrying his coffin onto the field.